You might know the situation: you’re on your own in a city that you don’t know too well or not at all, and then you get hungry. If you are foodie and if you love to have your meal in good company in a restaurant that has been recommended by locals – then you might have a problem right now. Worst case will be to get lost in choices and to end up at a tourist trap (and I bet you’re not one of those people who order Pizza to your hotel room which would be even worse, wouldn’t it). This is where Claudio Seidler und Tom Jakubowicz come into play. They invented the social dining platform mealUp to bring people together for dinner at hand-picked restaurants in Berlin, because having great pasta or fine Thai food is way better if you can share the experience. 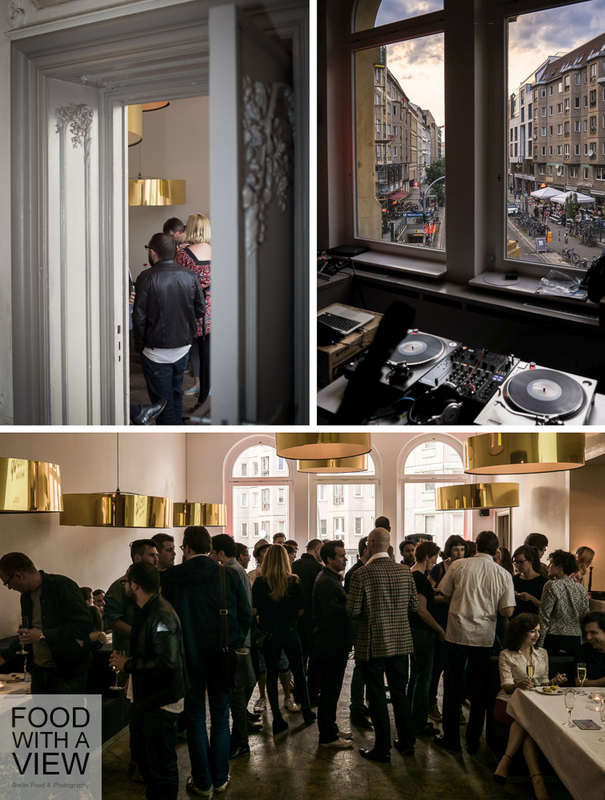 Last Friday, we have been invited by muxmäuschenwild to the launch party at Münzsalon, and on that occasion, Tom told us a bit about his former life between China and London – and the fact that traveling often comes along with being new to some place, sooner or later. That’s how he had the idea for mealUp – never eat alone. So, how does it work? On the mealUp website, you get an account for free where you give some personal details (to let other users know a bit about who you are), and then you’re ready to go: choose a restaurant (currently, it’s about 120 hand-picked places), add an approximate time frame – and see what’s happening and who joins in. You can also do it vice-verse – watch out who wants to have dinner and where and write a message. Once some people have found each other (it’s the appointment’s initiator who makes the choice), book your table via the platform and have a nice evening among old and new locals, private and business travelers and everybody else. 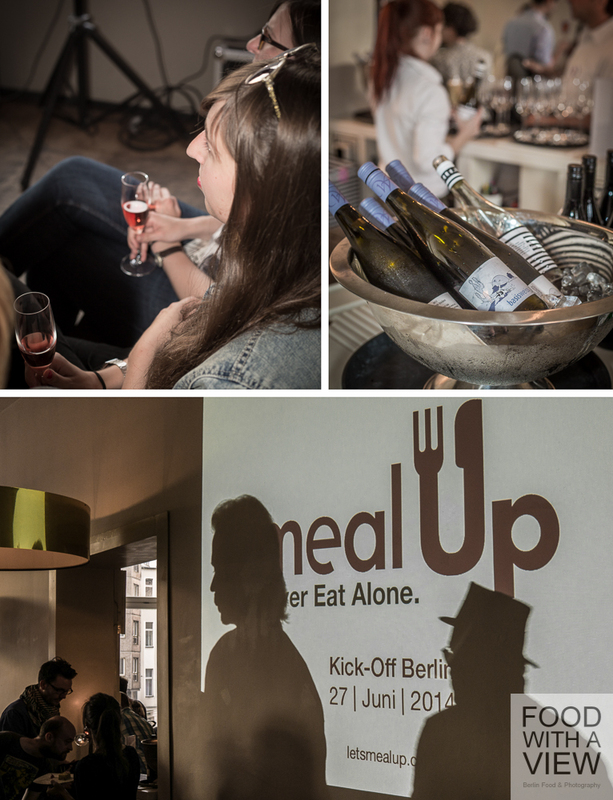 At the kick off party last week, we had the impression that a totally mixed crowd is attracted by the idea, so chances seem to be good to get to know very different people via mealUp. We like the idea – and the choice both of the location and the food for the launch party have been convincing, too. 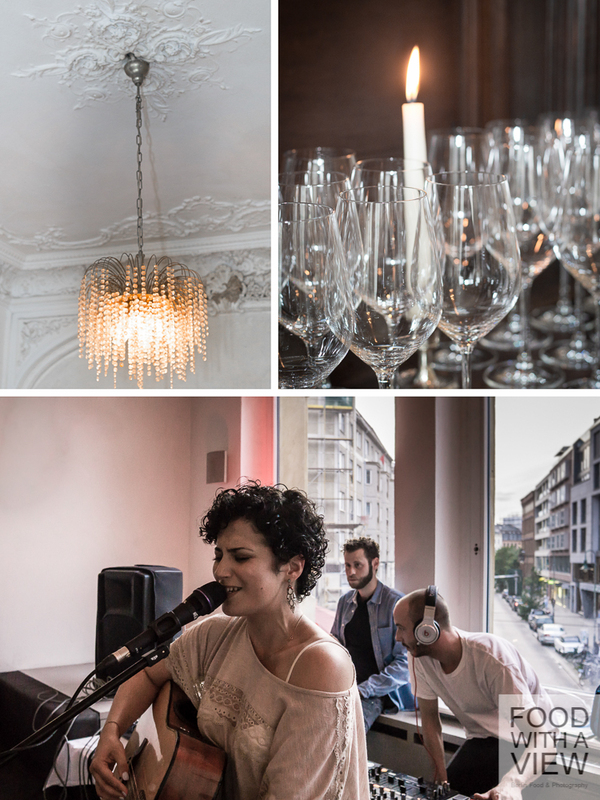 Indeed, we had a good time at beautiful Münzsalon with a nice view, met interesting people, had lovely treats by Patricia Ganswind and Phoebe Wang (we enjoyed quiche truffles and little cakes) and heard soulful life music by Portuguese singer songwriter Maria Rui. That’s what a mealUp evening should be like, shouldn’t it. Viele kennen das: Man ist allein privat oder beruflich in Städten unterwegs, die man kaum oder gar nicht kennt – und weiß nicht, wo und mit wem man essen gehen könnte. Und dann findet man sich an Orten wieder, die ohnehin in jedem Reiseführer stehen, oder wenn es ganz dicke kommt, an einer uninspirierten Hotel-Bar. Food-Bloggern passiert das natürlich nie im Leben ;-). Aber alle anderen haben manchmal den Reise-Food-Blues – dabei würden viele Locals ihr Wissen um gute Pasta oder den besten Thai der Stadt sehr gern mit den Durchreisenden teilen und miteinander plaudern. Das ist die Grund-Idee von mealUp, einer Social Dining-Plattform, über die hungrige Menschen mit Lust auf neue Kontakte sich finden und verabreden können. Ausgedacht haben sich das Claudio Seidler und Tom Jakubowicz, und zwar aus eigener leidvoller Erfahrung beim Unterwegssein. 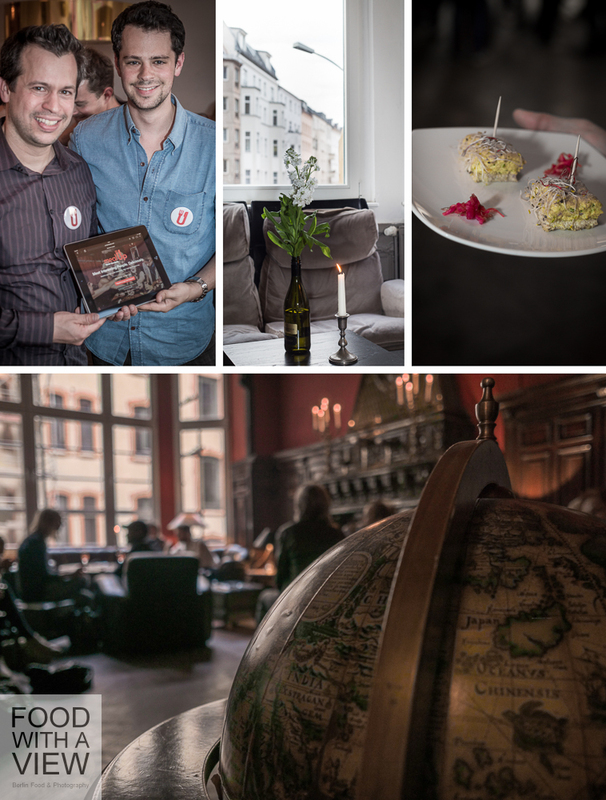 Am vergangenen Freitag waren wir vom muxmäuschenwild-Team zur Kick-Off-Party im sehr schönen Berliner Münzsalon eingeladen, und dort erzählt Tom uns von seinen Jahren zwischen China und London und davon, dass er gern gut isst – und wie so die Idee entstand, mit Stadt und Leuten in Kontakt zu kommen. Und genau das passiert bei mealUp über virtuell verabredete Restaurant-Besuche an Orten, die vorher einen Foodie-TÜV durchlaufen haben. Den bildet das mealUp-Team selbst, und ihre Teststrecke ist Berlin. Ein Händchen für Locations und Catering haben sie mit dem Münzsalon und Finger-Food von Patricia Ganswind und Phoebe Wang schon mal bewiesen – wir erfreuen uns an Quiche-Trüffeln mit Pink Sauerkraut und kleinen Kuchen zur Life-Performance der portugiesischen Singer-Songwriterin Maria Rui. Was uns auffällt: Es ist eine ziemlich bunt gemischte Menge, die hier zum Launch zusammenkommt, und das überzeugt uns davon, dass mealUp wirklich ganz unterschiedlichen Menschen die Möglichkeit geben möchte, sich an einen Tisch zu setzen. Die Motivationen können dafür genauso unterschiedlich sein wie Alter, Sprachkenntnisse und Beruf. Damit sich auch die finden, die sich neben dem gemeinsamen Essen potenziell viel zu erzählen haben, richten sich die Nutzer der Plattform einen kostenlosen Account mit ein paar persönlichen Angaben ein, und dann kann es losgehen: ein Restaurant aus dem Netzwerk auswählen, in dem man gern essen würde (derzeit sind es rund 120), ein Zeitfenster angeben und abwarten, wer sich meldet. Oder umgekehrt schauen, wer wo ein Dinner oder Lunch ansetzen möchte. Hat sich ein Grüppchen gefunden (wer den Termin initiiert, darf sich seine Mitessenden aussuchen), wird – ebenfalls über die Plattform – der Tisch gebucht, und dann darf man gespannt sein, wie der Abend wird. Im Idealfall lernt man nicht nur tolle neue Orte kennen und isst vielleicht das Trüffel-Risotto seines Lebens, sondern hat dabei auch noch inspirierende Tischgesellschaft. Wir finden die Idee spannend – und haben interessante Leute getroffen und einen schönen Abend gehabt. What a splendid idea. Hope this idea makes it to other cities soon. Great that you like the idea, Hilda! I love this idea. It can be tricky to meet new people sometimes. Especially if you just want company rather than a romantic relationship. When I’m in a new place, I usually try and find a place that is packed with locals. They must be doing something right, right? Always avoid tourist traps! So nice to hear/read from you again, thanks for your visit! I can well imagine that there can be misunderstandings when meeting new people for lunch or dinner. That’s why mealUp offers badges to clealry indicate if you’re looking for a date or just for company or for business contacts. Ja, das war sehr nett – lieben Gruß zurück! Wir mögen die Idee auch, und der Abend war wirklich nett. Lieben Gruß zurück! What a great idea! Perhaps, I should initiate the move here in Istanbul 🙂 The only problem is that I’m not so FB savvy. I did a guest cooking even when I first started my blog and it’s kind of on hold because of the reason. It’s difficult to find like-minded people here for some reason. But I’ll keep trying! Thnaks a lot for your comment – we liked the idea as well, and we hope it will expand :-).